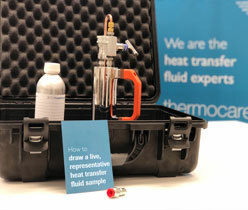 Accurate Sample Analysis by the Thermal Fluid Experts Global Heat Transfer provide a specialist on-site representative sample collection service. The heat transfer fluid sample service is carried out by an experienced trained engineer using the bomb method. This method is unmatched in terms of accuracy of results (when data is analysed professionally) and widely recognised and endorsed by the petrochemical industry. If you prefer to take your own thermal fluid sample, we will install a water cooled sampling system on your site and we will manage the testing and analysis on your behalf. The sample cooler is a heat exchanger in which the sample fluid temperature is lowered. The sample of thermal fluid is forced through a stainless steel helical pipe encased in a cooling water jacket.